Who is comforting those terrified, crying children at night? Who is giving hope to their heartbroken, desperate parents, sitting in jail cells and not knowing where their children are? WASHINGTON — In the book (and movie) “Sophie’s Choice,” a mother is forced by Nazi soldiers to choose which one of her children will live and which one will die. It is achingly painful to contemplate. But what is truly horrible is that every day our government is forcing parents fleeing from repressive regimes to decide whether to seek sanctuary in the United States and give up their children or stay and face torture and death. The rest of the world is stunned by what is happening in America, once the mouthpiece for human rights. No longer. The United Nations has declared that the U.S. is violating international law by separating babies and children from their parents trying both legally and illegally to enter the United States. There are so many that a U.S. senator, Jeff Merkley, D-Oregon, said he found children being warehoused. There are so many that children are being herded together in an empty Wal-Mart warehouse. Not surprisingly, journalists have been barred from interviewing the parents or seeing how children are treated. Every parent knows the panic of losing a child in a crowded store or park, just for a few minutes. Imagine having your 18-month-old ripped from your arms because you asked for asylum in the U.S. from a gang in your homeland that vowed to kill you and your children. True story. Who did not find it chilling to listen to Attorney General Jeff Sessions, the highest ranking law enforcement official in the country, say adamantly that people who try to come to the United States with their children must be punished — by having those children taken from them. Who is comforting those terrified, crying children at night? Who is giving hope to their heartbroken, desperate parents, sitting in jail cells and not knowing where their children are, fearful they may never be reunited? What long-term psychological damage is being done to parents and children? The cruelty of this is stunning. How can this be happening in our country? Yes, the immigration system is broken. Yes, Congress has refused to fix it. But this current crisis is Trump-made. The number of immigrants coming into the U.S. without documents had been declining. Former President Barack Obama’s Dreamer decision was giving hope to children brought to the United States illegally by their parents and now enrolled in college or working. Donald Trump killed it and now has decreed that children and parents be separated. Bizarrely, this crackdown on people who want to live and work in America comes just as the need for workers is soaring. The unemployment rate is only 3.8 percent. Business can’t expand or must even cut back because they can’t get workers. Also barbaric is the current U.S. decision to make families applying for entrance to the U.S. stand for days in 90-plus-degree weather to discourage them from filling out paperwork necessary for an interview and review of their case for asylum. Trump blames Democrats for passing “bad legislation” that requires separating children from parents at the border. That is not true. No such law exists. 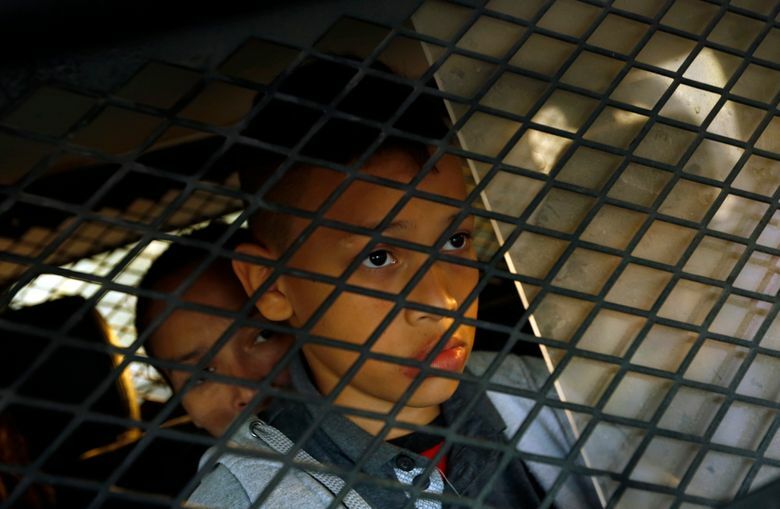 The policy is Trump’s new “zero tolerance” decision. The idea for separating children from parents sprouted ignobly in the office of John Kelly, who was then director of homeland secretary and is now White House chief of staff. It was dropped as too extreme and immoral but then pushed by people close to Sessions. Zero tolerance was announced April 6 by Sessions and the new homeland security secretary Kirstjen Nielsen. They ordered authorities to prosecute all instances of attempted illegal border crossings including those with no previous offenses and treat children as unaccompanied minors. The uber nationalism of this is profoundly alarming. The immorality of it is staggering. We are becoming a pariah because of our cruelty. Lady Liberty’s light is flickering. Where is the outrage?